This Copycat Crunchwrap Supreme is a recipe unlike any other. It's inspired by one of our very favorite Taco Bell drive thru classics. What's great about this easy dinner pick is that it is a cinch to recreate in your home kitchen. Make this dish something special by picking up the ingredients at your local farmer's market. Add as many vegetables as you wish to this craveable copycat dish and have fun making it your own. Once you make it, it'll soon be a regular in your dinnertime rotation. Drop warmed nacho cheese across the top of the meat. Place tostado on top and press down gently. Spread sour cream on top of tostada shell. Place a skillet over medium-high heat. 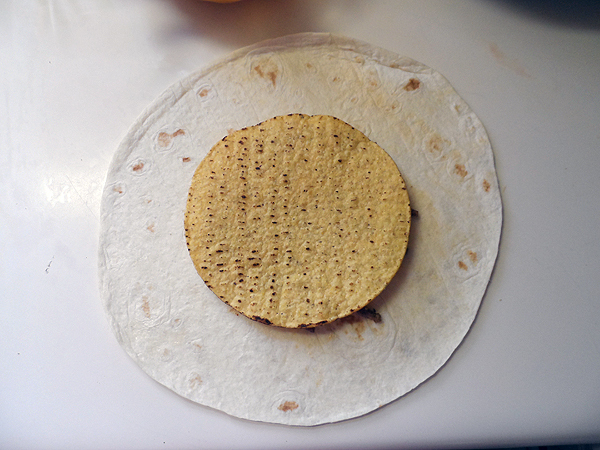 Fold the sides of the flour tortilla up around the tostada shell, creasing the folds as you go. Take the whole thing and place it face down in the skillet and gently press down with a spatula. Allow the tortilla to brown a bit in the pan, 2-4 minutes. Flip over and brown the other side. Remove from pan and cut in half, serve. To be honest, the Taco Bell crunchwraps are a guilty pleasure of mine, too. They're rather easy to make up at home, and I like that they can easily be customized with other types of cheese and ingredients. One of the other copycats recipes I saw mentioned having an extra tortilla on hand to cut up and fill in the hole created if the edges of the tortilla don't overlap properly. I really appreciate the step by step photo instructions. Crunch Wraps are my guilty pleasure! I can't wait to make my own at home.